This is an award certificate that I have created. 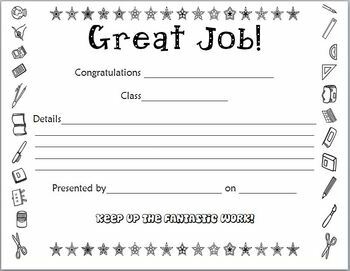 I give this out to students who are putting in the effort, motivated, kind, responsible, or are earning good grades in my class. Positive reinforcement! This is much easier to complete and give to the student than to call home- some parents don't want to be bothered unless there is a problem. Plus I think it is more important for the student to know they are doing a great job than for the parents to know it. The students are encouraged to take this home and share it with their parents.